What's a Unit in Artifact? The most popular TCG’s and CCG’s all simulate a battle, a war in which your army has to conquer that of the enemies. And what would an army be without the cavalry, whether they call them minions, creatures or monsters? In Artifact, they’re the hero cards and (melee) creeps, collectively known as units. Towers and improvement are not considered units. Each color has a wide variety of units, and they all have their unique traits. Red units, for example, tend to have both a high attack stat and a large health pool. Black units, on the other hand, generally shift more towards attack stats. The only neutral units in Artifact are the melee creeps that spawn at the start of each round. 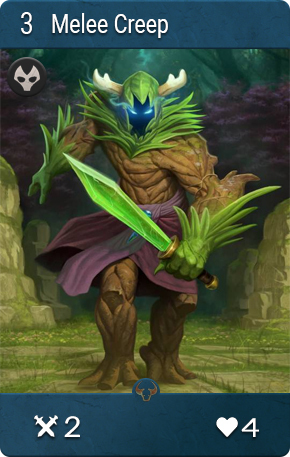 Since they’re so core to the gameplay in Artifact, it is only natural that there are many cards that interact with units. However, there are only a few cards that can interact with both your opponent’s and your minions. Most of the time a card will either work with ‘allies’ (friendly units) or just ‘enemies’ (opposing units). Steam Cannon is an exception to this, as it can shoot enemy and friendly units alike.